Film production company BosBros, producer of award winning movie classics such as MINOES, THE HORSE OF SINTERKLAAS, DOLFJE WEREWOLF and WIPLALA, joins the Phanta Vision group, producers of films and series such as VALS, STORM LETTER OF FIRE, CLEAN HANDS and CIRCUS NOËL. From now on BosBros productions will be produced in collaboration with the Phanta Vision group, consisting of Phanta Film, Phanta Basta! and Goldman Film. Film producer and founder Burny Bos, who received the Golden Calf Culture Award in 2014, sees the collaboration as an important step for the future of his company. Petra Goedings, film producer and co-founder of Phanta Vision, is also enthusiastic about this joining of forces. In this way, an important, international brand from Dutch film and television industry is maintained while Phanta Vision strengthens its position in the market. Peter Mullan, Emun Elliott, Sam Hazeldine, Bill Paterson and Rebecca Front have joined the cast alongside Thekla Reuten. Principal Photography has started on psychological thriller Marionette, directed by writer/director Elbert van Strien. He has also written the script together with Ben Hopkins (Simon Magus, The Market). The film is set in Scotland and will be shot entirely on locations throughout Luxemburg and Aberdeenshire. Marionette is a high concept thriller for a broad audience and tells the story of a therapist (Thekla Reuten), who loses her grip on reality when a ten-year-old boy claims he can control her future. The film is produced by Claudia Brandt and Elbert van Strien from Accento Films (Two Eyes Staring) and Burny Bos from BosBros (Miss Minoes, The Zigzag Kid) alongside co-producers Jani Thiltges from Samsa Film and Arabella Page Croft and Kieran Parker from Black Camel Pictures. “We’re delighted to have assembled such a wonderful award-winning cast and creative team to bring Elbert’s passion project to the big screen. We’re thrilled that we have begun principal photography on this fantastic project and we are very excited to see it come to life“, says producer Claudia Brandt. Marionette is a Dutch-Luxembourgish-UK co-production; financiers include The Netherlands Filmfund, the Netherlands Filmproduction Incentive, The Luxemburg Filmfund, Screen Scotland, Avrotros, CoBO Fund and Creative Europe. Thekla Reuten is set to star in Marionette, a chilling English language psychological thriller to be directed by award-winning Dutch director Elbert van Strien. Van Strien, whose first feature Two Eyes Staring (Zwart Water) was sold to 40 territories and picked up for a US remake by Charlize Theron and Lionsgate, also wrote the film together with Ben Hopkins (The Nine Lives of Tomas Katz, The Market). Reuten plays child psychiatrist Marianne, who moves to Scotland to start a new life after the tragic death of her husband. She starts treating a disturbed ten-year-old boy called Manny who draws pictures of terrible events and claims he can control her future. As the evidence grows that Manny’s drawings could be predictions of real, future events, Marianne begins an obsessive quest for the truth that will derail her life. BosBros will produce alongside Accento Films, the company Van Strien owns with producer Claudia Brandt. Samoa Film (LUX) and Black Camel (UK) will coproduce. Shooting will take place in autumn in Luxembourg and Scotland. Thekla Reuten has recently starred in spy thriller Red Sparrow alongside Jennifer Lawrence, Joel Edgerton and Jeremy Irons for 20th Century Fox. Her many credits include In Bruges with Colin Farrell, Brendan Gleeson and Ralph Fiennes and The American opposite George Clooney for Focus Features. 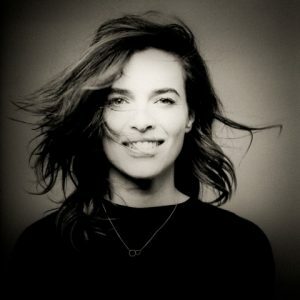 She has appeared in the hit Sky 1 Crime TV-series Stan Lee’s Lucky Man and BBC One Drama series Hidden and in some of the most beloved Dutch films based on bestselling books, including The Dinner and the Oscar nominated Twin Sister. (Nederlands) Meister Frosch, Monsieur Grenouille, Mister Frog; Meester Kikker verovert de wereld! The Burny Bos Best Project Award 2017 was handed out at Cinekid this afternoon by Burny Bos to the project Lucy Goes Gangsta. The Award Ceremony concludes the Junior Co-production Market, the international integrated two-day event that enables financiers, broadcasters and producers to assess new and innovative children’s projects across film and television sectors. 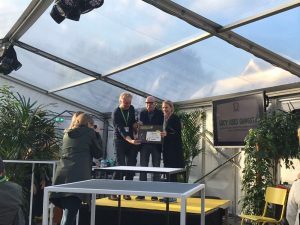 The jury, consisting of screenplay writer Tamara Bos, script editor & coach Ernie Tee and script consultant Linda Snoep, handed out the award to the best overall, international project of the Junior Co-Production Market. The Burny Bos Best Project Award consists of a €2.500 cash prize and BosBros’ assistance in realizing the project. Lucy Goes Gangsta is written by Till Endemann and Andreas Cordes. Directed by Till Endemann. Producer of the project is INDI FILM GmbH from Germany. Tamara Bos shared with us that she recognized herself in the little Lucy and thinks it’s funny and even necessary that children sometimes do somenthing naughty. The project that has been chosen by the jury stands out for the heart-warming way it takes us to the dilemma of the main character. In a clearly structured story we experience how she struggles with the question: are we allowed to do something bad, even if it is for a good reason? In this movie the extremely well behaved Lucy steals our hearts by committing the ultimately bad action: a bank robbery!